Butterfly weed seeds are one of the easiest types of seeds to collect from the garden. 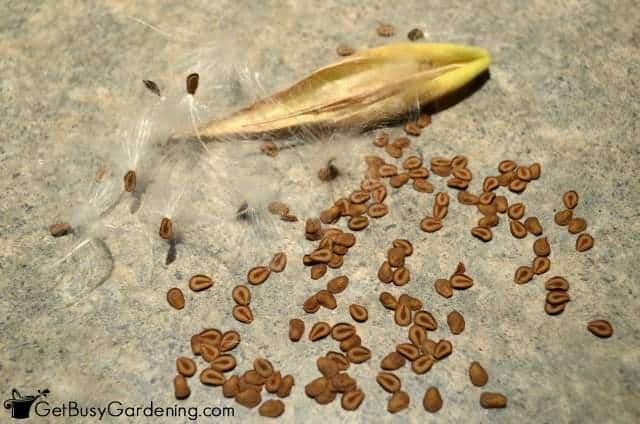 In this post, I will show how to harvest butterfly weed seeds from your garden step-by-step, and also show you how to store them for next year. Butterfly weed is one of my favorite plants that I have growing in my garden. Not only does it add amazing color to the garden, the butterflies flock to it. Plus, it’s a host plant for everyone’s favorite monarch butterfly. Butterfly weed is also one of the easiest seeds to collect from the garden. After the flowers fade on the plant, butterfly weed gets these gorgeous seed pods. If you want to collect butterfly weed seeds from your garden, allow the seed pods to dry on the plant. When the seeds are ready to be harvested, butterfly weed seed pods will turn brown and start to break open on their own. 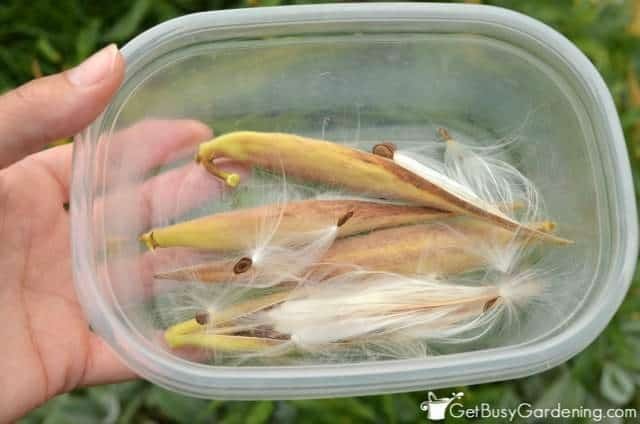 The seeds have puffs of cotton attached to them, which allows them to fly in the wind and seed themselves all around the neighborhood. So, make sure you collect the seeds as soon as the pods start to break open, or they may disappear on you. Butterfly weed seeds are flat, brown and shaped like a tear drop – and there are a ton of seeds in each seed pod. 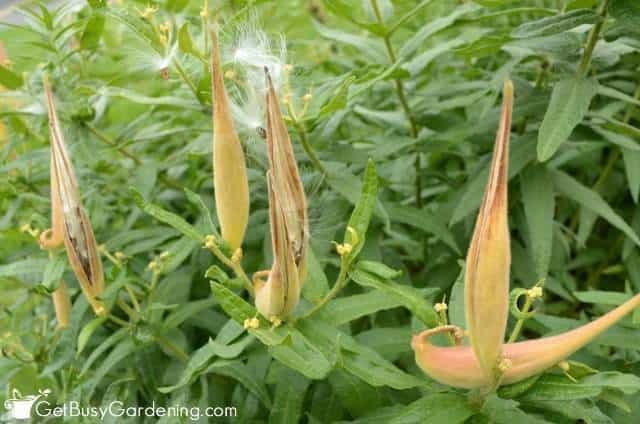 Like I mentioned above, they are attached to white cotton, which can make the task of harvesting butterfly weed seeds a bit more tedious. 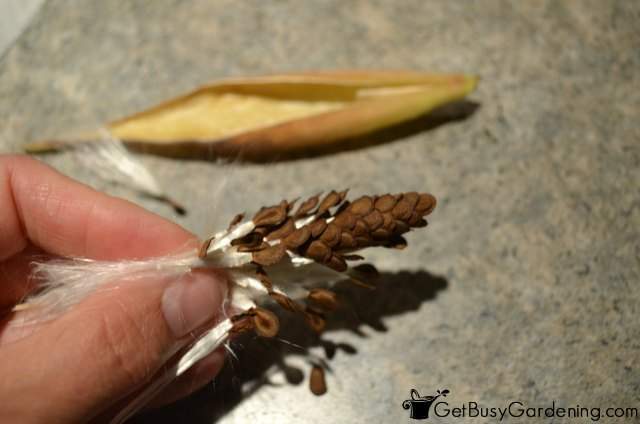 Clip the seed pods off the plant and drop them into a container or bag. Don’t attempt to harvest butterfly weed seeds outside, otherwise every time the wind blows you’ll be chasing them down the street. Once you’ve collected the seed pods, bring them inside. Like I said, it can be a bit tedious to harvest butterfly weed seeds, because of the fine fluffy stuff that’s attached to the seeds. So start by breaking open the seed pod. 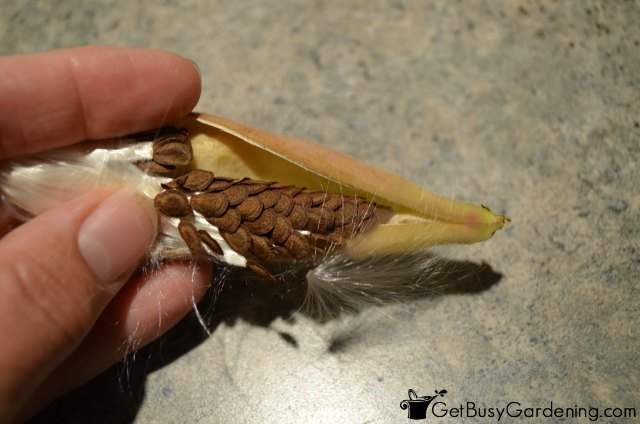 Then firmly grab the entire fuzzy clump and pull it out of the seed pod. Wait, don’t let go. Gently pinch the seeds to tease them away from the fluffy stuff. It can be a messy job, so you might want to keep the vacuum on hand. You can plant butterfly weeds seeds as soon as you harvest them, or you can store them for planting next year. Allow the seeds to dry out completely before storing them. You can store your seeds in a plastic container (film canisters are the perfect size! 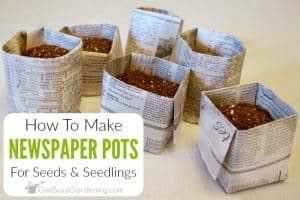 ), paper bag or seed envelope until spring. To share with friends, you can order customized seed envelopes or try making your own seed envelopes! I like to use a plastic shoe box to organize my seeds, or you can use a Seed Keeper. It can be difficult to find butterfly weed seeds for sale, but many garden centers should carry them starting in mid-winter through early spring. 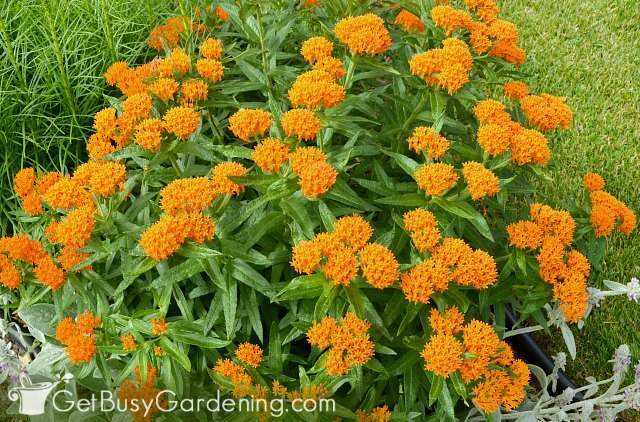 Otherwise you can always buy butterfly weed seeds online. 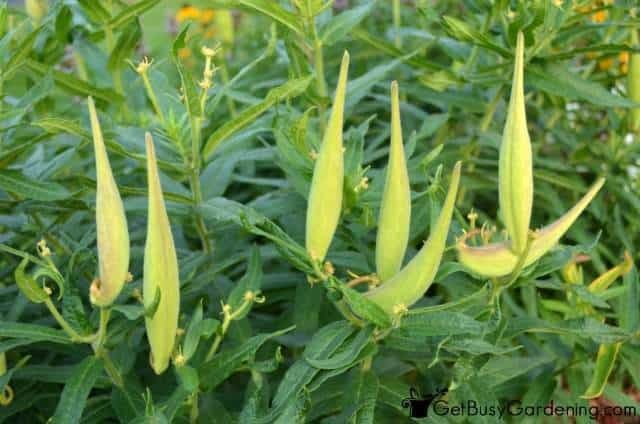 Here are some great, quality seeds to get you started… Butterfly Weed Seeds. 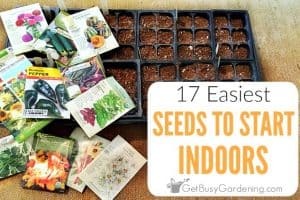 If you want to learn how to grow your own seeds for your garden indoors, then my Starting Seeds Indoors eBook is perfect for you! 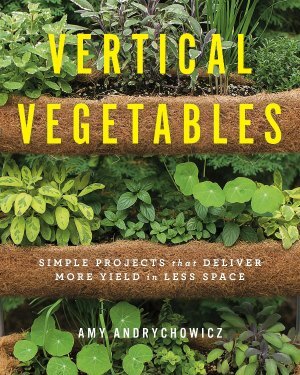 It’s a quick-start guide that will have you growing your own seeds indoors in no time. Download your copy now! 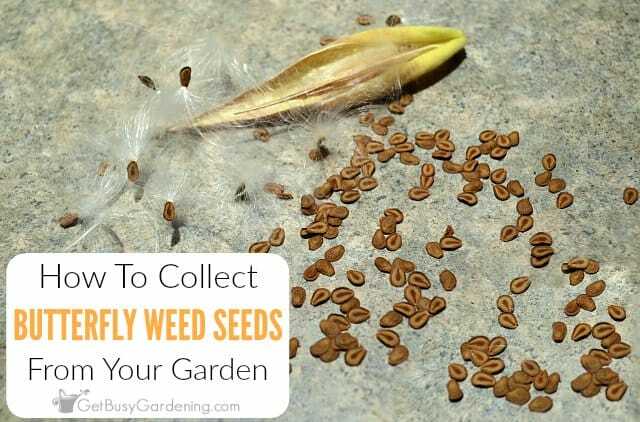 Share your tips for how to harvest butterfly weed seeds in the comments section below. Awesome post! 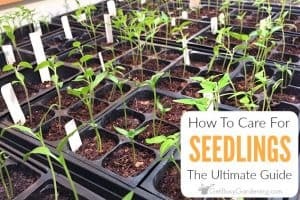 I always love reading posts on how to harvest/save seeds from a variety of plants that grow. A big one around here is milkweed. Milkweed seeds themselves are very expensive, which is weird because it grows in abundance along roadways here in NJ. I just planted a monarch butterfly garden this spring and my butterfly weed turned out great! I noticed the seed pods and luckily found this website. The pods on one of the plants turned brown and I noticed one had started to crack open on the side. I assumed this meant it was ready for the seeds to be harvested. However, when I split open the pod what appeared to be the seed pods were white and there was no white fuzziness on the inside …. I’m worried I picked them too soon! Is there anything I can do to help them become healthy seeds? The seeds are white not seed pod, my bad! Yes, unfortunately it does sound like you harvested your butterfly weed seeds too soon. It’s weird that the seed pods were brown and cracking open before the seeds were mature. Are there any other pods on the plant? If so, wait until the pods open up and the white cotton is starting to stick out before harvesting them. Otherwise, I think you’ll have to wait until next year. You could try planting the seeds you have and see if they’ll grow though, you never know. Thank you for posting this information. I love attracting butterflys to my garden. I noticed the seed pods on my butterfly weed plant yesterday; I am excited to harvest the seeds so I can plant more plants next year. Awesome! You’re welcome. 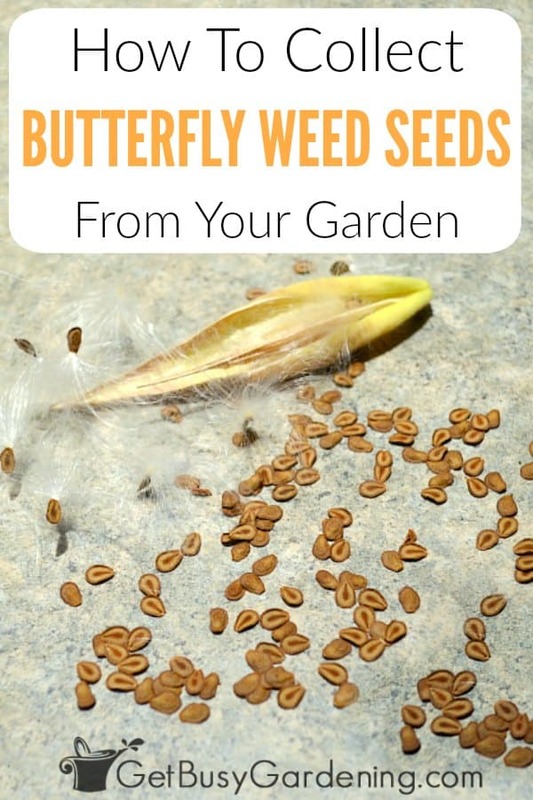 Butterfly weed seeds are super easy to collect and grow. Have fun! Can the seeds be frozen to plant after I move to a new home? Sure, but you don’t need to freeze your butterfly seeds to store them. It certainly wouldn’t hurt them though. How deep do you plant the seed? How many seed per area? I read somewhere that if you bring the seeds inside they need to be kept cold for an extended period of time to mimic winter conditions. So you know how cold or for how long? I have a containerized butterfly plant that has done wonderfully this summer, and has many pods now. My worry . . . In northern Minnesota, frost is coming by later October. The pods are yet green and firm. I’d like to harvest ripened pods before I transplant the parent. This is a risk. Any advice? P.S. I have already gathered Marsh Milkweed from the wild, nearly a month ago. I would just leave the pods on your butterfly weed plant until they ripen. I don’t think transplanting it would make a difference. Also, butterfly weed plants are super hardy, so frost won’t hurt the plant or the seed pods. When do you plant the seeds in NE Ohio? 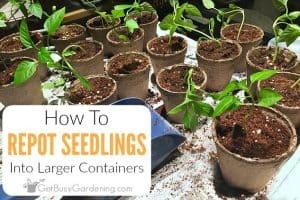 You can plant them either in the fall (directly in the garden) or early spring (either directly in the garden or indoors). 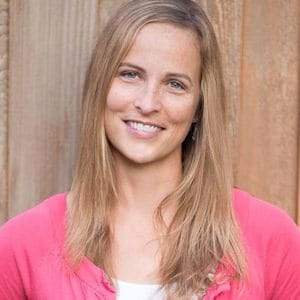 They would also work with the winter sowing method, if you want to experiment with that.